These brunsli cookies are my favourite! Chocolate and chewy with just a hint of cinnamon and cloves – what a delight. 1 tbs vanilla flavoured sugar Beat the egg whites and sugars until stiff peaks form. 3 tbs Kirsch Add the powdered almonds, the grated dark chocolate, the bitter cocoa, the cinnamon, the powdered cloves and the Kirsch. Mix dough till all ingredients are well blended. 50 g crystallized sugar Sprinkle the crystallized sugar on work surface. Roll out dough on sugared surface, about 4 mm thick. It may be easier to cover the dough with parchment paper and then roll it out. With a 2.5 or 3 cm heart-shaped cookie cutter, cut out cookies. 20 g soft butter to grease baking parchment paper. 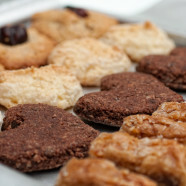 Cover baking sheet with the buttered parchment paper and place heart shaped cookies – cookies should not touch each other. The next day Preheat over to 200 C.
Bake cookies for 5 minutes – maximum. Do not leave in oven after cooking time, as they will dry out and will not be chewy. Remove from oven – set aside on rack and let cool. These cookies can be kept in cellophane bags or a tin box.